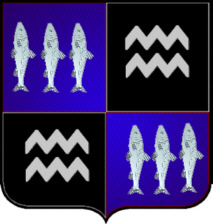 Coat of Arms: A shield divided quarterly: 1st and 4th, blue with three silver fish haurient; 2nd and 3rd, black with two silver wavy bars, each charged with two red wavy palets..
Crest: An arm in mail armour holding a baton. Spelling variations include: Way, Waye, Wey, Whey, Weigh, Weghe and others. First found in Devonshire where they were seated from very ancient times before the taking of the Domesday Book in 1086. Some of the first settlers of this name or some of its variants were: George Way, whosettled in Boston in 1633; Edward Way settled in Virginia in 1655; Elizabeth Way settled in Nantasket, Mass in 1630; Richard Way was a merchant of St. John's, Newfoundland, in 1779.